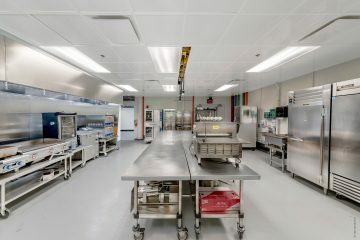 The newly renovated Food Science and Human Nutrition Pilot Processing Plant is a modern, flexible facility built to meet the needs of students, researchers, and the international food industry. Plug-and-play utilities, large equipment selection, and a product development kitchen provide an ideal environment for hands-on learning opportunities, new product or process development, and small-scale food production. 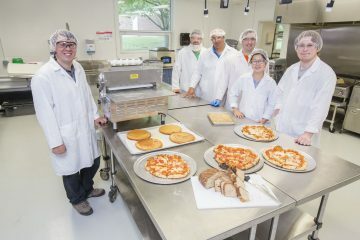 The Illinois Sustainable Food Project brings together the Department of Food Science and Human Nutrition, the Department of Crop Sciences, and University Housing Dining Services at the University of Illinois. Grain and produce grown as part of research and teaching programs, student initiatives, and local collaborations are processed by students in the FSHN Pilot Processing Plant into finished products that are served in the University Dining Halls. The finished products typically travel less than five miles from field to fork, and create innovative student learning and research opportunities.